For the last sixteen years, I have been working in support of communities in the province of La Guajira, Colombia, being displaced by the massive Cerrejon opencast coal mine. The mine is owned by London-listed companies Anglo American, BHP Billiton and Glencore. Cerrejon Coal has a slogan, ‘Coal for the world, progress for Colombia’. Given the sufferings of the communities most directly affected by the mine, it’s hard to know what the company means by ‘progress’. 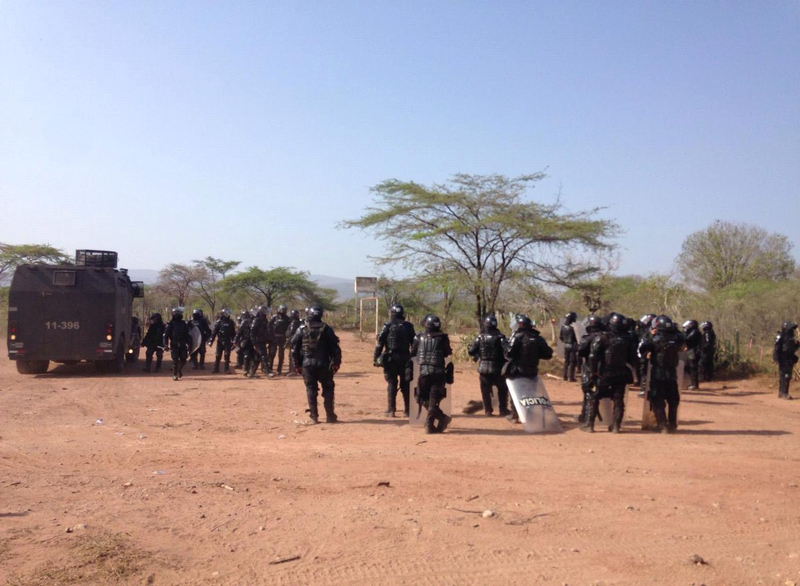 And during my most recent visit, as part of a Witness for Peace delegation in June of this year, we heard the statistics from friends at the organisation Comite Civico para la Dignidad de La Guajira showing how the advent of mining to La Guajira has helped destroy food sovereignty and local jobs. * now it was planning to divert an important stream, the Arroyo Bruno, and almost everyone we spoke to was opposed to this; the only people who did not oppose it just thought it was inevitable, and wanted compensation for the damage it would cause them. Many of these concerns were contained in an open letter sent to the company shortly before the delegation visited. Our delegation went with community representatives to meet representatives of the Cerrejon Coal company at the mine. The meeting began with young members of our delegation – students from the USA – giving their impressions of the area after several days of visiting communities. They had been horrified at what they had seen and heard. Then each community representative had a few minutes to summarise their community’s concerns. It was all unrelentingly negative, because the impacts of the mine on their lives have been so unrelentingly negative. The Cerrejon Coal representatives were upset. They told the students and the community representatives that they should not say such nasty things about them – they were doing their best. Several of them gave the company’s perspective on what was being done on community relocation, water provision and other social and environmental matters. After the meeting, one of the social responsibility department officials asked me whether I thought that the company had in any way improved its behaviour over the past 16 years. I said I would have to think about that. 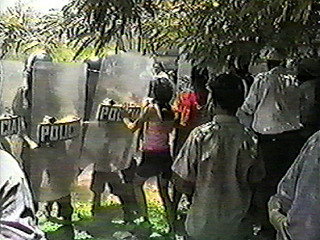 One thing that has changed for the better is that, as a result of the review of its operations by an independent panel of inquiry in 2008, Cerrejon agreed to undertake negotiated community resettlements rather than talking to families one by one and paying them inadequate compensation to go away and find somewhere else to live. But there is an awful lot of dissatisfaction with the process and with the quality of the new communities. I have not looked into the history of environmental restoration at the mine, and it’s true that Cerrejon appears to be making great efforts to do it right. But even that’s a double-edged sword. It’s also true that at least one colleague at one NGO in Colombia, with extensive experience of Colombian mines, says that Cerrejon is the best mine in the country. But that’s only because all the others are so dire. While I was in Colombia, I was reading a book called Soil and Soul: people versus corporate power, by Alastair McIntosh (2). It’s a book about the Highland clearances in Scotland, the modern legacy of that injustice, and the current community fightback against it. I was struck by the parallels with La Guajira. Read ‘coal’ for ‘ new breeds of sheep’ in the following extract. At one level, what is going on in La Guajira is simply the colonisation by foreign multinationals, aided and abetted by the Colombian Government, of land that has been used for many generations by Indigenous people and people of African descent, in the interests of shareholders in the UK and elsewhere, and those of the national and local elites whose economic interests coincide with theirs. I think that passage pretty much sums up the world view that makes places like the Cerrejon mine seem acceptable to so many. So we’ll carry on our work of solidarity with communities seeking justice from Cerrejon Coal and its London-listed multinational shareholders Anglo American, BHP Billiton and Glencore. I don’t doubt that the social responsibility department at Cerrejon Coal are well-motivated people, genuinely wanting to do a decent job. Nor do I doubt that the company’s behaviour in 2016 is an improvement on its behaviour in 2000 when I first visited. But the whole enterprise is part of a massive, structural injustice which is causing continuing suffering to the communities it affects and enormous damage to local hydrology and ecosystems and, through the burning of its coal, to the planet as a whole. We in Britain are implicated in this injustice because so many of our banks, insurance companies and pension funds invest in the three multinationals which own the mine, and some of our electricity is generated by the coal it produces. So it’s our problem. (1) See extracts from community testimony below. She also told us: “Sometimes the company does classes about how to make food, how to make fast food, as there is a food company in the area which might provide work. But the classes ended and nobody got work. Then came a course in sewing, and how to make the rags used in the mine, but the money was lost. Women here don’t work – Cerrejon won’t provide work. Anyone over 40 won’t get work. Cerrejon sometimes helps three or four people but not the rest. They had a working group [mesa] but paid community leaders to be part of it. There was supposed to be money to help people over 50 to find jobs but that commitment was not fulfilled either. He went on: “The mine is the enemy of the communities and we don’t see a process where we can be friends. They say things but they don’t fulfil them. We’ve been in negotiations with the company since 2009 and we’ve seen that the company wants to take advantage of our lack of knowledge, of our innocence. It is an unequal process conducted in the interests of the multinational. … We tried to enter a collective negotiation process. The company said they would not move anyone until the last person had been negotiated with – a collective process. But that’s not what has been done. There are still people here resisting. It is not easy. We have had no help from the government at local, departmental or national level. It’s a struggle between a tethered donkey and a tiger.